"British Columbia Steelhead, Extinct or Extirpated?" 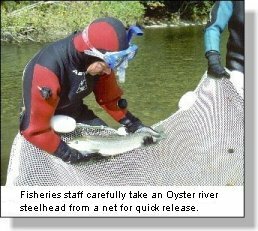 The drastic need in 1998 to place angling closures on east coast Vancouver Island streams because of the extreme low numbers of steelhead is a major example of the serious situation facing all British Columbia steelhead. In 1997 some east coast V.I. rivers were closed to angling when B.C. Fisheries staff, doing annual number count swims, located very few fish in these rivers. In fact, in some streams less than ten fish were spotted during times when major runs of fish should have been in the streams. Late 1997 swims provided a major wake-up call when in some cases even fewer fish were spotted. 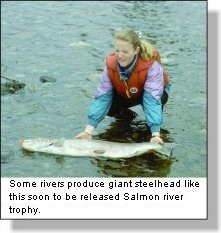 It is definitely a time to address the specific needs of these and other British Columbia steelhead races. British Columbia has two lists of threatened wildlife species. The first, the "RED LIST" shows those wildlife species which "... are candidates for legal designation as endangered or threatened." The second list, the "BLUE LIST" shows those species which "... are considered to be vulnerable or sensitive." Some of the species more commonly known on the RED LIST include; Pacific Giant Salamander, Northern Goshawk, Sage Grouse, Spotted Owl, Vancouver Island Marmot, Sea Otter and Dall's Sheep. The RED LIST totals 64 separate species. The BLUE LIST total 87 separate species. Some of those more commonly known include the Western Rattlesnake, Great Blue Heron, Trumpeter Swan, Bald Eagle, Barn Owl, Steller's Jay (British Columbia's official bird), Wolverine, Grizzly Bear and Vancouver Island's Roosevelt Elk. But, while these species are very carefully managed and in many cases completely protected, where is the red or blue list of "endangered or threatened," "vulnerable or sensitive" summer and winter steelhead species? It is a known fact that almost all Vancouver Island rivers and streams (over 300 complex watersheds) once held viable populations of summer and winter steelhead. We also know that many V.I. creeks once had populations of winter steelhead along with resident and anadromous cutthroat trout. In many cases these viable populations consisted of adult returns of only a few hundred fish but, these were evolutionary totals which nature considered sufficient for these stream specific races. individual watershed environment has created a separate and genetically different: Gold River steelhead, Campbell River steelhead, Puntledge River steelhead, Stamp River steelhead, Nanaimo River steelhead, Cowichan River steelhead, and so on, throughout every British Columbia watershed. The beauty and survival of the English language lies in the fact that we do have words which express precisely and completely emotions, facts and situations. One such word is extirpated. It means, to eradicate or to destroy wholly. 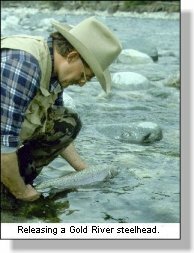 In the case of British Columbia steelhead it is my fear that there is an acceptance of individual stream steelhead eradication for the concept exists that there is always another river where we can find steelhead. Such is the case with British Columbia's unique river steelhead. Yes, they have been eradicated, and, in some cases destroyed wholly. 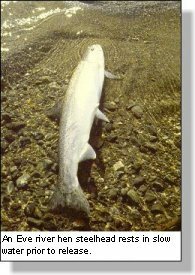 I would prefer to suggest, as have some fisheries biologists, that we have not only destroyed some steelhead races wholly, we have caused the actual extinction of individual unique river species. these rivers on their own. In the United States, according to Art Tautz, B.C. Fisheries Research Director, genetically unique fish stocks are listed as a specific species and hence can come under the protection of the U.S. Endangered Species Act. Canada has not gone that far yet but, Tautz feels that most fisheries scientists feel that the U.S. model is the way to go. they must be managed and protected site specific to that race's watershed. middle of the vast Pacific Ocean. Legislation to protect each race is a necessary starting point. 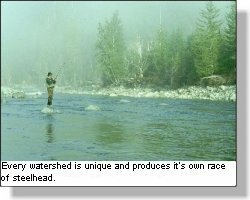 This can be done if we recognize that steelhead are the barometer of healthy streams and that each watersheds individual steelhead race is unique.